You will need Adobe Flash Player 10 or above to effectively interact with www.LearnKoranOnline.com. 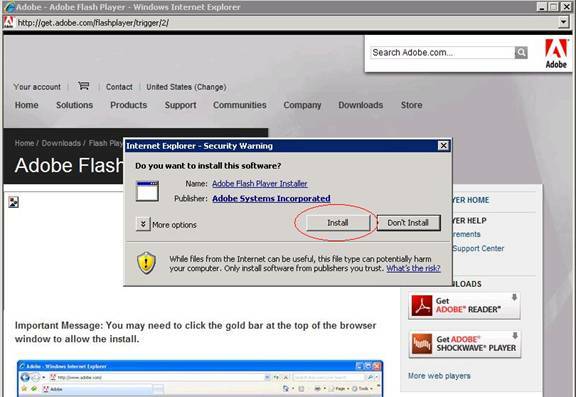 You can download and install the latest version of Adobe Flash player from Adobe’s web site at: www.adobe.com or you can download and install it from www.LearnKoranOnline.com. The download is less then 1.5 Mb in size and should take less then a minute to download on to your computer over a DSL / Cable connection. The following instructions are for Internet Explorer 7 running on Windows Xp. If you need help with other browsers and different operating systems then contact Technical Support at: 877-256-7262 option 3. When you visit www.LearnKoranOnline.com the site will check to see if you have Version 10 of Adobe Flash player. If you have pop-ups blocked (Figure 1) then you will see a message that says pop-up blocker is blocking access to our site. Click on the pop-up blocker to see options being provided to you. Click on the link: Always Allow Pop-ups from this site (Figure 2). Although we try to minimize the use of pop-ups, by clicking on this link your system will be able to see the pages on our site without prompting you every time a pop-up occurs. Click on the Yes button (Figure 3) to allow your system to access our site. 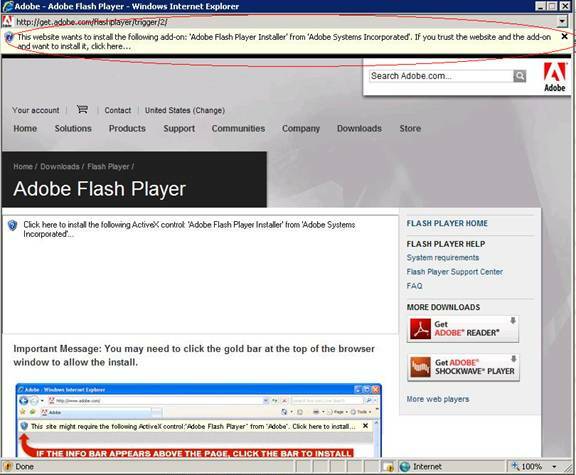 This will take you to Adobe’s site to download and install the latest Flash player. If you don’t want to install Google search tool bar then uncheck the check box labeled Free Google Toolbar (optional). Click on the button Agree and install now (Figure 5). 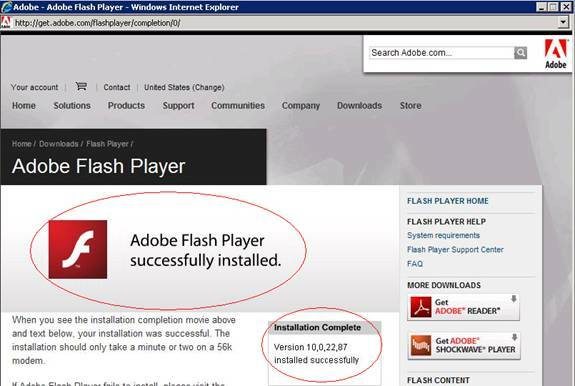 This will install the latest version of Flash player on your system. On clicking on the message bar it will display a message asking you if you want to Install ActiveX Control (Figure 7). Select the option: Install ActiveX Control to continue. The next screen will ask your permission to install Adobe Flash player on your system. Click on the Install button (Figure 8) to continue. 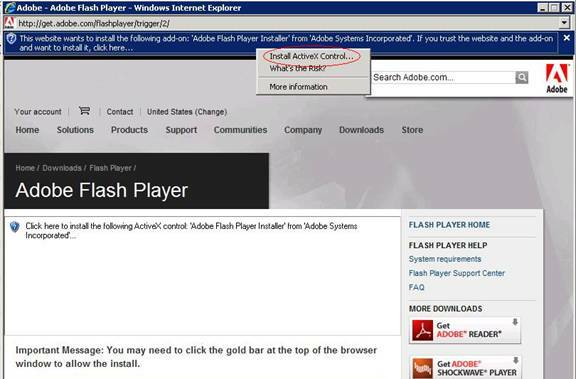 Once the Flash player has installed on your system you will see an animation that shows that the Flash player has successfully installed on to your system. Alternatively you should also see a message that says Installation Complete (Figure 9). 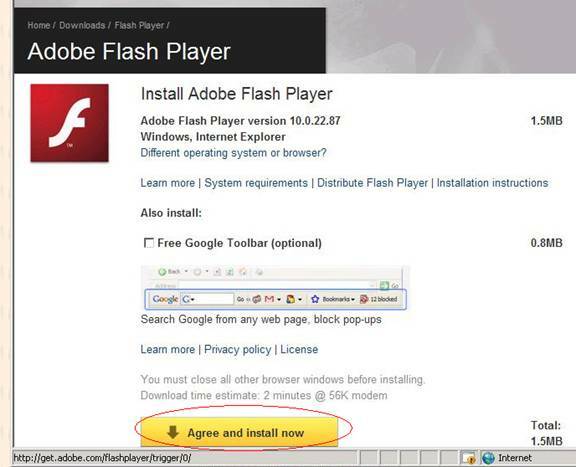 Close the Adobe Flash installer window. 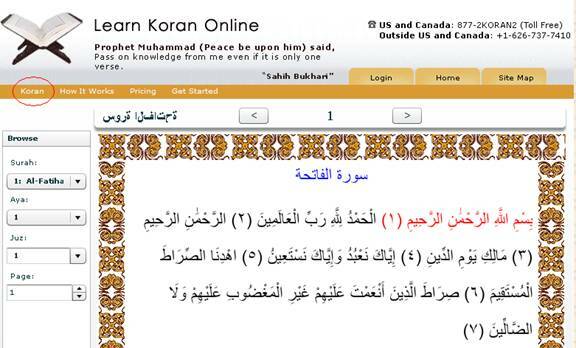 Now when you click on Koran (circled in red – Figure 10) on the menu bar at www.LearnKoranOnline.com you should see the holy Koran on your screen. For help in testing to see if your microphone and web camera (optional) are functioning with our web site please call Technical Support at: 877-256-7262 option 3. If your computer microphone and web camera (optional) are functioning properly then you will be able to use them in our class room. Once you login to the class you will see buttons labeled Start My Video and Start My Audio. Click on Start My Audio (Figure 11) to carry on a voice conversation. 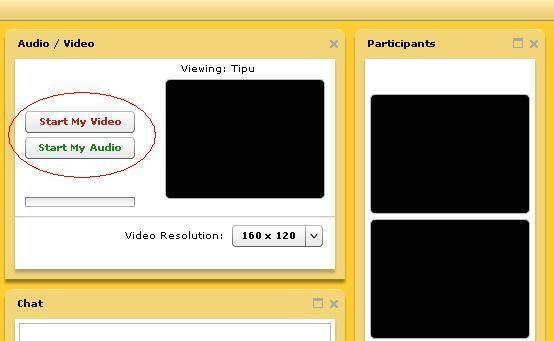 If you would like to show your video to the teacher (optional) click on Start My Video. 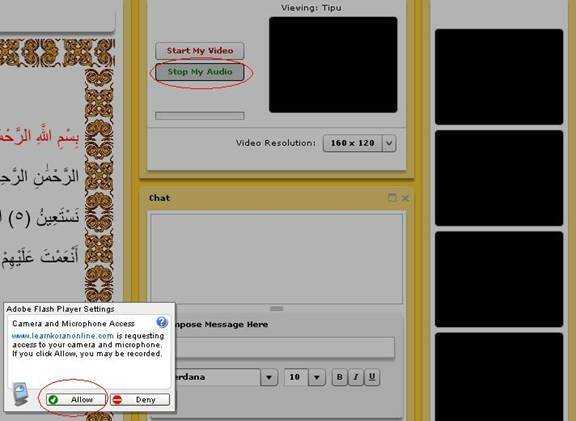 You will see a pop-up asking you to Allow your microphone and web camera to be accessed by www.LearnKoranOnline.com (Figure 12). Click on the Allow button to continue. 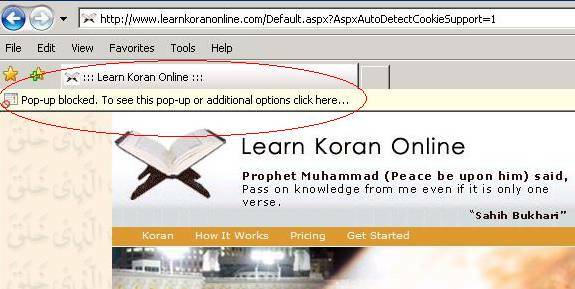 Once you sign out of your class or if you close your browser window www.LearnKoranOnline.com will no longer access your microphone and web camera.